Another ski season is nearly complete. Remarkably, I can see from my desk chair the White Heat trail looking like a mid-winter day with nary a speck of dirt, a strip of perfect corduroy gleaming in the morning light. Given that we are in the midpoint of April, it sums up the season at least regarding weather—a slow start but bountiful late season snow. The real estate market, on the other hand, has remained steady since the last update in November. For the purposes of this report, communities covered include Albany, Bethel, Hanover, Greenwood, Newry and Woodstock, and include for single-family sales, $150,000 and up and land $20,000 and above. As with a year ago during this timeframe, the most prolific sales were condominiums, with a total of 37 units versus 42 a year ago and there are 16 currently Pending. One of the more notable storylines is the success of the Tempest Ridge project, as four of the developer units from Phase III (the final phase) closed in the first quarter, the remaining two are Pending (and there is a Resale under contract), which means with successful closings of the last two the project is officially sold out. Of the sold developer units, two were end units and two were interior units and pricing ranged from $485,000 to $575,000. In my 14 years of selling slopeside condominiums in the Sunday River region, I have never seen inventory as low, especially for one- and two-bedroom properties. As an example, following the market downturn after 2009, there were regularly 18 to 22 one-bedroom condos from which Buyers could choose, and it meant a lot of lengthy showings with so many to view. For the past 18 months or so, however, there has been an average of four to six units available. It has been a similar trend for two-bedroom condos as well, in fact there is currently just one two-bedroom available as of this date. So where have the sales been in these categories? For one-bedrooms, one in Sunrise sold for full ask price at $135,000, four sold in Fall Line at prices ranging from $117,000 to $132,000, two in Brookside at $118,000 and $122,000 and one in White Cap at $115,000. For two-bedrooms, three sold in North Peak, two at $205,000 and one at $185,200. Another three sold in Brookside, two at $152,000 and one at $160,000. The North Peak units are a compelling story in that sales prices have returned to pre-downturn prices. There are currently five North Peak units Pending. Studios have also fared well, with three closings in Cascade at $75,000, $79,000 and $82,500, and one in Brookside at $78,000. The South Ridge townhomes has always been a favorite—lower fees, close to the action yet quiet, and a townhome style. Apparently, buyers and owners alike think so too, as there is not a single one available currently: two sold this season at $330,000 and $264,000, with both having relatively short periods on the market. Other slopeside sales include two Locke Mountain townhomes at $464,000 and $444,256. Sale prices in this neighborhood have historically been wide ranging based on location (trail access), views and upgrades. There are currently six units available for sale (out of a total of 72). Another duplex condo sold on Viking Village Road for $584,000, this one is just a short jaunt across Barker Mountain Road to the Roadrunner Trail. 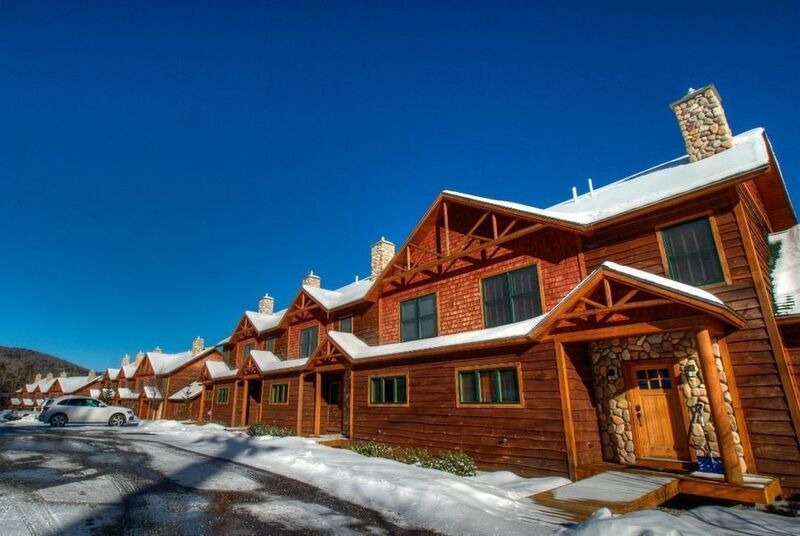 And finally, off-mountain condo sales in Newry included a Powder Ridge condo ($220,000) and one at Ashleigh’s Way (The Pines development) for $292,000. In Bethel, two units sold at the Bethel Inn Fairway townhomes at $165,000 and $164,000 and two on the water in Greenwood (Birch Road) at $70,000 and $50,000. Single-family sales lagged behind from the same period a year, with just 27 sales this season versus 50 a year ago. With this said, late summer and fall of 2017 was very strong in this sector so it should not be considered alarming. Eight out of the top 10 for descending price order were in Newry, with the highest in Newry in The Peaks that sold at $760,000. A spec home sold in the same neighborhood for $585,000. Another sold in The Colony at $740,000 and two sold in Peaks Village at $520,000 and $415,000. Other home sales in Newry include one on Pond Road (Sunday River Village) at $475,000, Kendall Bog Road at $365,000 and Mountain View Road at $305,000. All were chalets except for the latter two. There were six sales in Woodstock, the highest, a contemporary home on Alpine Shores Road sold at $345,000, then chalets on West Summit Road, $317,000, Oak Hill Drive, $265,500, Outlook Road $250,000, Mann Camp Road, $225,000 and a cottage on Conservation School Road, $230,000. A camp sold in Albany on Peace and Plenty Road (who wouldn’t like that address?) for $275,000 and a chalet on Hunts Corner Road for $150,000. Hanover had four sales—a chalet in the relatively new subdivision Hanover Pines at $270,000, and a ranch on Main Street at $192,000 and camps on Howard Avenue and Emerson Road at $150,000 and $155,000, respectively. Finally, in Greenwood, there were six sales, including chalets on India’s Way, $235,000, Greenwood Road, $205,000 and Log Cabin Lane, $185,000 and Rocky Lane, $156,500, a farmhouse on Old County Road, $217,000, and a cottage on Main Street $187,000. Land sales continue to be a sector that is not growing despite the uptick in the market. There was a total of 15 sales in the timeframe, compared with 23 from the prior season. Leading off in Newry was the sale of a parcel that sits on the Ridge Run trail, so the only slopeside lot that was left available following the successful sellout of The Glades subdivision. It sold for $385,000. There were two other that sold in Newry, both at The Peaks, at $150,000 and $110,000. A waterfront lot on South Pond Shores sold for $212,000 and in Greenwood, a 169-acre parcel sold for $160,000 on Richardson Hollow Road and a 69-acre parcel sold on Kennedy Lane for $48,000. In years past a strong end to the season results in continued momentum long after the lifts close, and the off-season brings out serious, focused Buyers. There is really no wrong time to put a property on the market or to start hunting for the perfect home or land on which to build.